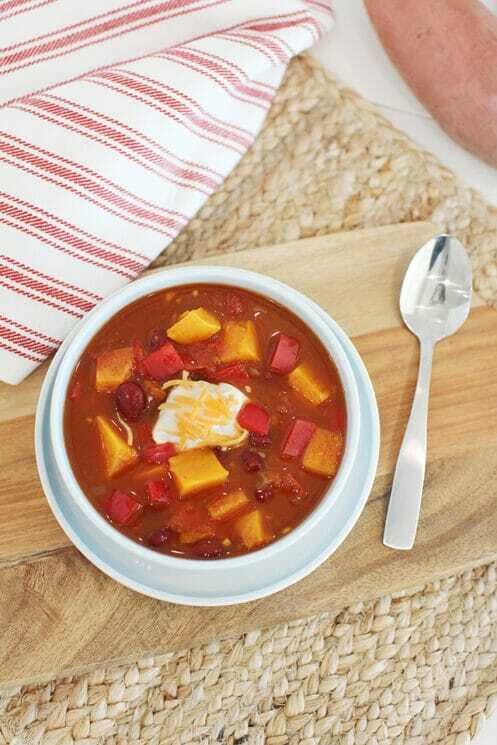 Crockpot Sweet Potato Chili- comfort food for cold nights! 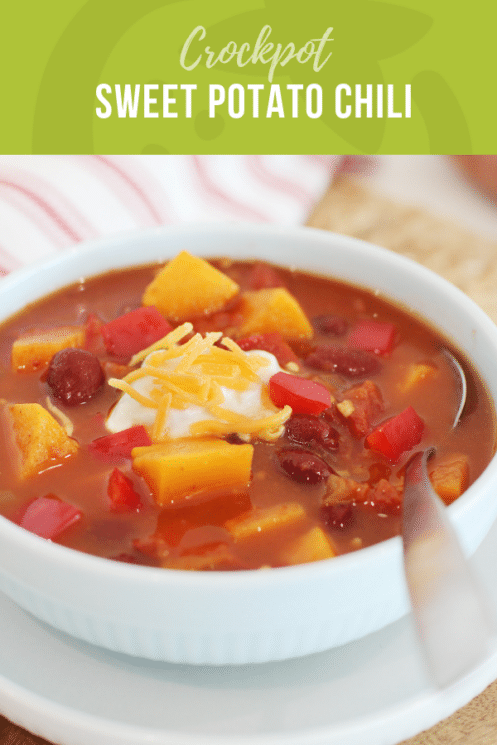 When kids like a dinner, such as chili, it provides the perfect opportunity to start slowly adding new ingredients. This will not only expose kids to subtle new tastes and flavors, but also train them to be adaptable, and less picky. 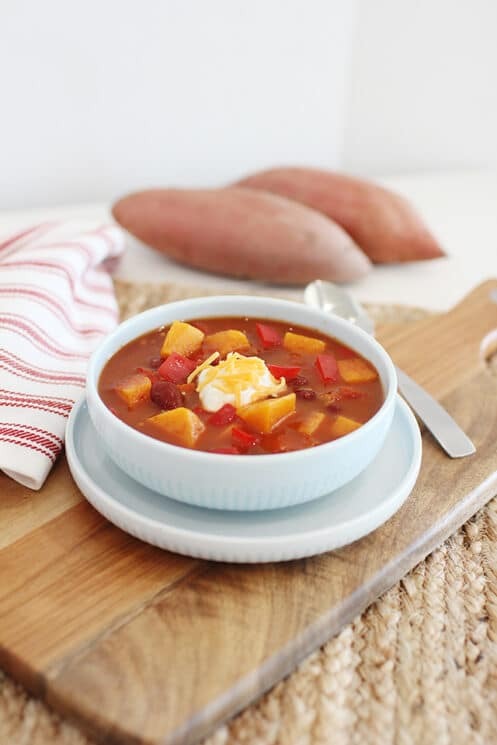 One thing we incorporated into an already amazing slow cooker chili recipe was sweet potatoes! Vitamin A- The rich color is a sign of it’s vitamin A content. In fact, the sweet potato contains a whopping 262% of the Daily Value. Fiber – Essential for better digestion and slowing absorption of food. Sweet potatoes actually contain double the amount of fiber as a white potato. Vitamin C– Many people don’t realize sweet potatoes are a good source of vitamin C, but it contains 29% of the daily value. Potassium – This mineral is important for maintaining cell fluid balance. 1 cup of potatoes contain 446 mg.
Maganese- a mineral that helps produce collagen and promote skin and bone health. The best thing about slow cooker chili like this is how easy it is to put together. Mostly, just dump the ingredients in a slow cooker and walk away. For this chili, we didn’t have to precook anything. All we did was cut the sweet potatoes, onions, and bell pepper. Then, in the crockpot add the veggies plus tomatoes, kidney beans, garlic, and seasonings. We cooked it for 6-8 hours, and then let the slow cooker go back to “warm” until we got home to eat. What I love about a vegetarian chili like this is there is no meat to worry about spoiling or growing bacteria. We like to serve our chili with chips, corn bread, or homemade bread! What do you like to serve chili with? 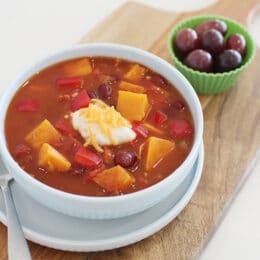 If your kids like chili, give these recipes a try! Peel and dice the sweet potato; chop the onion and bell pepper. Drain and rinse beans. Add all veggies to a 5-6 quart slow cooker, along with the tomatoes, beans, minced garlic, and seasonings. Pour in OJ and water, stir, cover, and cook on low for 6-8 hours or until the onion is translucent and the sweet potato is fork-tender. Garnish with shredded cheese and/or sour cream if desired. Serve with grapes on the side.